As the Democratic presidential contest heats up, Hillary Clinton is resorting to some unorthodox behavior to gain an advantage: She barked like a dog in front of a crowd of supporters. 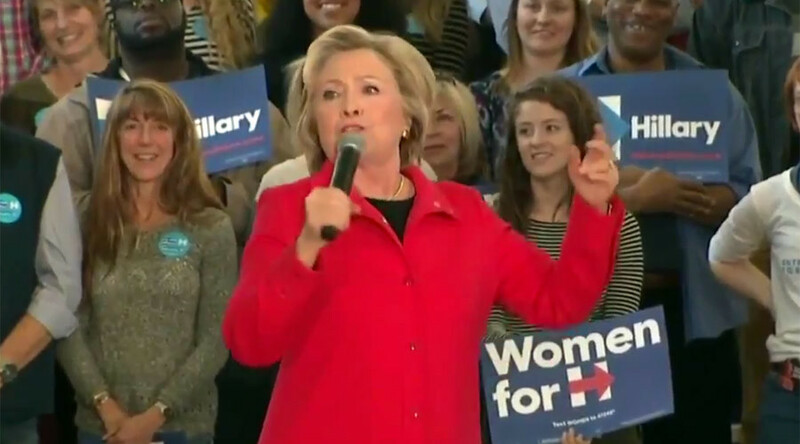 The unusually expressive moment came Monday, during a rally in Reno, Nevada, as Clinton told the crowd about her favorite political ad from when she lived in Arkansas, where a fact-checking dog would bark whenever a candidate said something that wasn’t true. “The announcer said, ‘Wouldn’t it be great if somebody running for office said something, we could have an immediate reaction as to whether it was true or not? Well we’ve trained this dog and the dog, if it’s not true, he’s going to bark’,” the former Secretary of State said. "I’m trying to figure out how we can do that with the Republicans, you know? We need to get that dog and follow him around and every time they say these things, like, ‘oh the Great Recession was caused by too much regulation’," Clinton said before yelping “Arf, arf, arf!" to applause. "I think we could cut right through a lot of their claims,” she added. Polls show Clinton and Vermont Senator Bernie Sanders currently in a dead heat in Nevada. A Washington Free Beacon survey released Friday showed both candidates at exactly 45 percent of support among Democrats. This is an enormous gain for Sanders since December, when a Real Clear Politics poll showed Clinton leading in Nevada by 20 points. Clinton’s unconventional stunt has already gone viral, with mash-ups of her barking with songs and movie clips.